Receive more info about booking "Jabali Acrobats" for your event! Direct from Mombasa, Kenya these phenomenal acrobats combine the artistry of fast paced movement, music, dance and incredible acrobatic elegance to perform a full stage theatrical extravaganza. 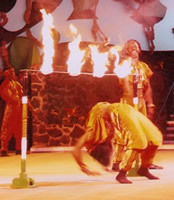 This thrilling performances exemplifies the link between athletics and the arts, as incredible acrobatics, contortions, tumbling, human pyramids, and chair balancing skill of these performers turns to dance, with the Congo Snake Dance, the Flaming Limbo Bar Dance, Skip Rope Footwork techniques and comedy to electrifying music. Audience participation is always included. 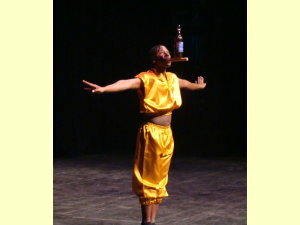 In addition to theatrical performances, stage shows and festivals worldwide the Jabali Acrobats perform NBA and College halftimes, and tour regularly with the Harlem Globetrotters. Other performances include a special invitation to perform for President Clinton in the White House, the Big Top Universoul Circus, the Big Apple Circus in New York, E.S.P.N. Sports Television Network, Crook and Chase Show, and Late Night With David Letterman to name only a few since this groups' onset to the world in 1995. Truly a Univer-Soul experience to be customized to any venue. "This group was very well received by our guests. They could always gather a large crowd. I appreciated that they had such a broad appeal across all ages and backgrounds." "Kenya's high energy super circus."